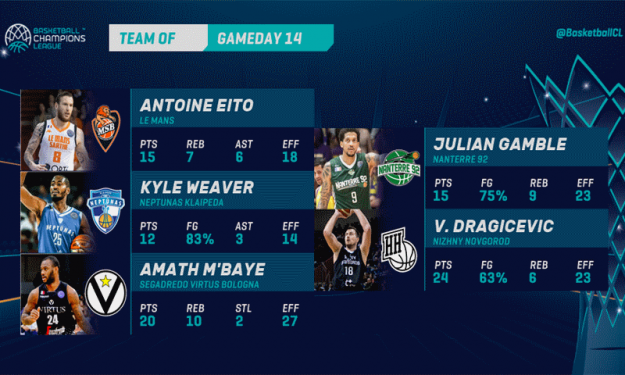 Basketball Champions League announced the Team of the Week for the final Gameday of the 2018-19 Regular Season. The Basketball Champions League Regular Season Round 14 was full of thrilling games. The playoffs field was completed and some players left their mark on the action around Europe. Antoine Eito, Kyle Weaver, Julian Gamble, Vladimir Dragicevic and Amath M’Baye were chosen by BCL for the Team of the Week. What happens when you’re on the cusp of victory and allow a big-time 3-point shooter to have space and launch a potential game-tying bomb? You get overtime! Okay, to give Anwil the benefit of the doubt, you don’t want to foul the man while he’s in the act of shooting to put him on the line for three free-throws or risk giving up a 4-point play. But still, giving Eito, who had just drilled a 3-ball from the right corner, a clear look at the basket in a clutch situation is never a good idea, and he punished Anwil by making a shot that ultimately forced overtime to keep MSB Le Mans’ Play-Off hopes alive. The French club then prevailed, 88-79. Eito finished with 4 3-pointers and had 15 points overall, along with 6 assists, 7 rebounds and a couple of steals. He was 5 of 14 overall from the floor but you know what, making shots that propel your team into the Play-Offs count for a little extra! If there’s been a player that’s been dazzling in the full-court transition game this season for Neptunas, a man who’s been weaving his way through traffic, it’s been Kyle Weaver. Yes, Weaver’s the name, leaving defenders in his wake is his game. Weaver had a sparkling 12 points in the 83-73 Neptunas win over visiting medi Bayreuth, including two that came from a tone-setting reverse dunk that got the crowd rocking and rolling. More significantly, the win kept Neptunas’ Play-Off hopes alive and then with Quentin Serron doing his thing for SIG Strasbourg and leading them to victory at Oostende, the Lithuanian club did indeed punch their ticket to the post-season. Talking about a tone-setting performance, that was M’Baye, one the most spectacular players in the Basketball Champions League this season. He’s been a revelation and don’t be surprised if somehow he finds a way onto France’s World Cup roster. M’Baye, who had 20 points and 10 rebounds for Segafredo Virtus Bologna in their 98-91 overtime triumph in Italy against Promitheas that clinched first place in Group D, drilled 4 3-pointers. But the shot that everyone is talking about from Turin to Sicily is that hellacious put-back dunk at the end of the extra period. Goodness me!!!! You have to hand it to Dragicevic for turning in his biggest performance at the most important time of the season for Nizhny Novogorod. In hostile territory, Dragicevic turned on the style by pouring in a season-high 24 points and led the Russian club to an 85-59 win over MHP Riesen Ludwigsburg. The 32-year-old Montenegrin was 10 of 16 from the floor and he also corralled 6 rebounds. Nanterre needed a big game from their big man and he delivered to the tune of 15 points and 9 rebounds in a 74-62 triumph at UNET Holon that clinched a spot in the Play-Offs for the French club. When Gamble is in his rhythm, it spells trouble for the opposition and it certainly did this time. Gamble also had a couple of blocks and a steal.